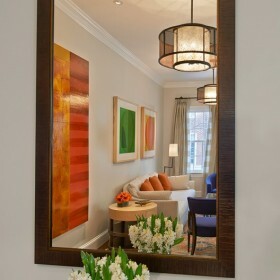 A warm welcome embraces you in homes designed by Carol Freedman. With thoughtful practicality and an exceptional eye for detail, she creates homes that are unmistakably comfortable, stylish and personal. Known for her special eye for color, Carol typically begins projects by creating a color concept and style direction to incorporate throughout a residence. Room layouts, furniture and fabrics are then selected which build upon this concept and reflect the client’s distinct design concerns. She believes that ‘real life’ must factor into thoughtful design; therefore she is accustomed to creating spaces friendly to children, families and house pets. Through all stages of the design process, Carol Freedman is consistently involved. From concept development through installation, she and her team of highly experienced professionals are responsive to each client’s distinct requirements. Carol Freedman is sensitive to the changing landscape of factors affecting the design industry. Environmental concerns, green concepts and ecologically sound products will continue to inform design selections. Carol Freedman Design stays attuned to these factors and their implications for each client’s project. The unique perspective that she brings to her work is a product of her diverse experiences in urban/environmental planning, consulting, textiles and interior design. Working with Carol is a pleasure from start to finish. She has an amazing sense of color and puts things together in very inventive ways. She is so talented. And, she is so organized–she makes it really easy. I would recommend her 100%! Carol took our rather dim, north-facing living room and opened it up with new windows, great lighting and bright colors. It’s the first time that I’ve ever enjoyed spending time in there in the winter. It’s the perfect “cure” for my winter-time blues! 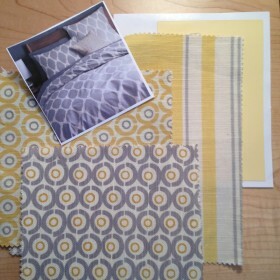 Carol helped us select the color scheme for our entire first floor and the furnishings for our family room and living room. 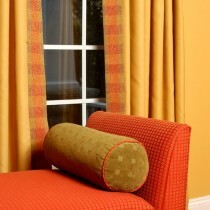 Her creative ideas on furniture placement complement and enhance the space and light in each room. 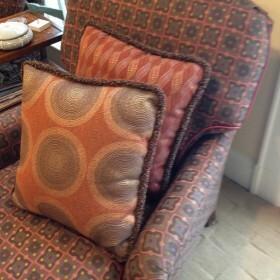 Carol’s use of color, patterns and textures are savvy and truly capture the feeling we wanted for our home. Carol was respectful of our budget and helped us combine furnishings from a variety of sources. She is a great listener, fun to work with, and super organized. We continue to love these rooms and would not change a thing. We love working with Carol! Her ability to interpret, and talent with expressing, our design tastes and desires is uncanny … and very much appreciated. 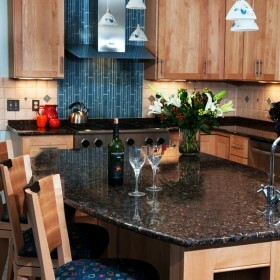 We first worked together on a full redecoration of two levels of our home. It seemed overwhelming to us, but Carol was able to create a pace with which we talked, looked at selections and ultimately, made decisions. Everything came together smashingly! Our Master Bedroom, Great Room, Dining Room, Kitchen, Breakfast Room, Game Room and my Office on the main level each possess their own personality yet transition from one to the next with ease and continuity. Our lower level is used daily for our businesses and, it, too, has a professional and distinctive look that carries themes from the upstairs. We are so pleased with the look and feel of our home that we have engaged Carol to work with us on the full renovation of our next home! A very talented and lovely professional, indeed. We reached out to Carol because of her amazing sense of color and her willingness to take on projects that have a whimsical element. 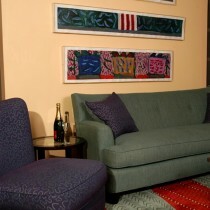 We have a collection of contemporary art, and one piece in particular that served as a focal point of the living room. 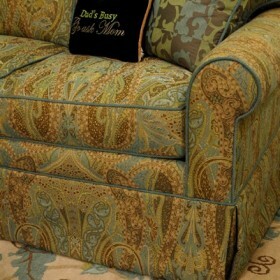 We wanted to have furniture that had its own personality, but didn’t overwhelm the artwork. Our selections included a beautiful custom rug that complemented the colors of the room, and use of whimsical fabric and use of patterns in the fabric of the furniture to give our room a fun, yet upscale look we wanted. Numerous people have complimented us on our selections, all due to Carol. I would love to have her complete our entire house. From the very first meeting, she understood out taste, and immediately presented us with many options we adored. I have never really thanked you for all that you did to make our project a wonderful reality. I appreciated your ideas, organization, kindness and humor, and how graciously you went to the extra lengths necessary to get everything right. It was a pleasure to work with you. Now it is my pleasure to be able to enjoy living in this beautiful space, which your work made possible. I have worked with other designers, and I enjoyed my experience with you so much more. I think that you worked wonderfully with our contractor and the suppliers. You are a good listener. You also helped us make the best choices by bringing great ideas while respecting our tastes and budget. And we had fun! That may be the best part. I really enjoyed working with Carol and I am very pleased with the results. 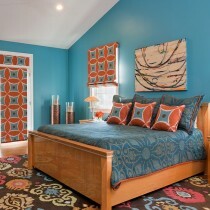 Carol has a great sense of color and aesthetics, and a sound vision of overall design and composition for a room. She combined her ideas along with the preferences I had expressed to come up with a transitional style which balances traditional and contemporary designs. Carol works with pleasure, persistence, and a sense of humor. We have used Carol for a number of projects. We love her eye for color and cheer! 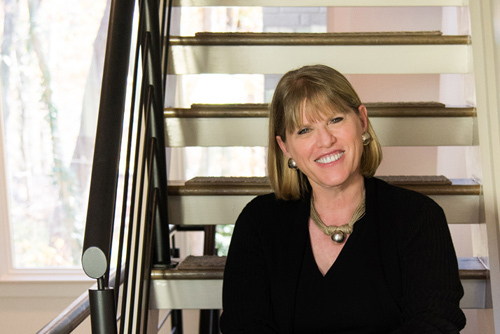 For one project, Carol stepped in when the construction firm we’d selected fell short in vital areas. Carol saved our project, our kitchen and our color scheme. She doesn’t know this yet, but we will hire her soon to re-envision the basement flooded this week by a burst pipe!